Everybody knows that moment when you're approaching the finish line of a burger or slab of meat-filled plate, and seemingly out of nowhere, you get overwhelmingly overheated. One drop of perspiration shows itself at first, but that one is quickly joined by many others as a full-on sweat begins. You have just entered the realm of meat sweats. And it turns out, this is actually a science-backed phenomenon. 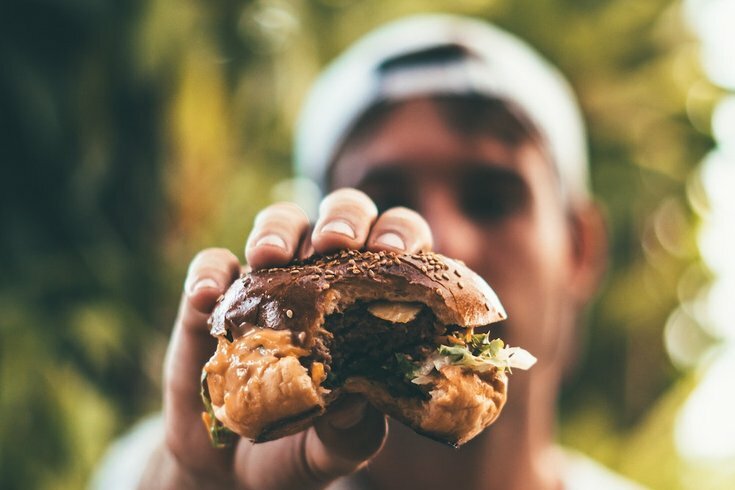 "Meat sweats are a physical reaction some people can experience after eating large quantities of protein-rich foods," says Verona Somarriba, MS, RDN, Clinical Nutrition Coordinator for the Division of General Surgery at the Icahn School of Medicine at Mount Sinai, to Men's Health. There are many things in your body that contribute to the onset of the meat sweats, but to put it simply: it's a culmination of many systems being activated in the body. Eating is basically a full-body workout, engaging everything from the mouth to the brain, digestive tract muscles and more. "This process requires energy, and the type of food that is ingested determines how much energy the body will use to break it down — this is called thermogenesis," Somarriba explains. It's no surprise that consuming large quantities of protein results in an increased body temperature — it's a lot harder for your body to break down compared to fruits and vegetables. Plus, if you're a big-time meat eater, your body probably loves protein so much that it immediately uses the energy from digested proteins to start making new ones, which is also a heat intensive process, Live Science explains. Apparently timing is also a factor when it comes to the meat sweats. "Meat sweats will happen for some immediately after eating, while others may feel the effects later on and wake up drenched in sweat in the middle of the night. The less often these meals are eaten, the higher the chances of experiencing this abnormal hypermetabolic spike," says Somarriba. Other factors leading to an increased susceptibility to meat sweats include: the person’s conditioning, body weight, eating habits (frequency of these types of meals) and other health factors. In terms of preventing the meat sweats, eating less meat is a good first step — especially if you're tired of having to remove your shirt in the middle of every meal. Healthline also suggests that meat sweaters try spreading their meals throughout the day. "If your meat sweats are indeed caused by the energy you expend during digestion, then it follows that less food will require less energy. Less energy equals less heat," Healthline explains. It's worth noting that experiencing the meat sweats regularly is probably a sign of a larger health issue. In fact, "if you're regularly sweating profusely while you're eating, you may have other metabolic disorders that you should probably get checked out," Live Science explains.